SocketSite™ | Hunters Point Redevelopment Plan For 10,500 New Units Approved! 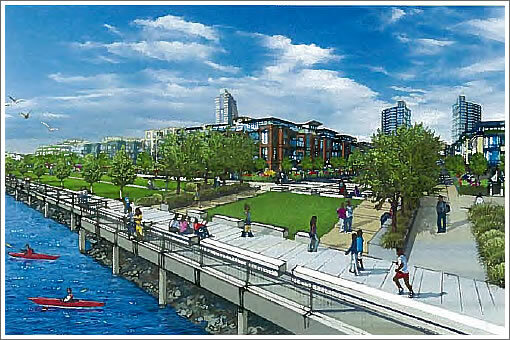 San Francisco’s Board of Supervisors approved the redevelopment plans for Hunters Point by a vote of 10-1 yesterday. Supervisor Daly offered the sole dissenting vote. 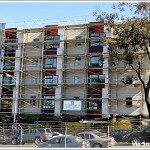 In 2008 San Francisco voters rejected a ballot measure which would have required 50 percent of the proposed 10,500 new Hunters Point residential units to be below market rate, but yesterday Supervisor Daly proposed a do-over amendment once again calling for at least half of the residential units to be affordable (up from an already unprecedented 32 percent). The board rejected Daly’s amendment by at vote of 6-5 with supervisors Avalos, Campos, Mar, and Mirkarimi joining Daly on the losing side. The board also rejected a proposed amendment from Supervisor Mirkarimi to eliminate a contentious bridge across Yosemite Slough connecting Hunters Point and Candlestick. Expect legal challenges to follow. Daly rejected. What happened? They didn’t want to add a 50,000-bed homeless shelter to the mix along with a shopping cart parking next to the handicap spots? lol – Daly demanded that 50% of the housing be made affordable, despite acknowledging that the project wouldn’t be financially feasible for Lennar to do so. The sooner this idiot leaves for Fairfield, the better. A bubbly real estate market could allow Daly’s ideas to thrive along with a normal business environment. Now that the bubble has burst, these over-reaching measures just prove impossible to fund. In addition, all the unsold BMRs provide a cautionary tale to future developers. Funny that excesses of capitalism helped social causes. That’s all gone now. Daly should be less greedy. Wow, this vote was close. While any of the “no” Supervisors voting yes would have effectively killed this project, Dufty is the most obvious swing vote here. It just shows how important the D8 election is going to be for the future of San Francisco. 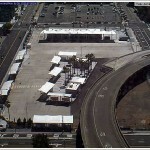 Does anyone know how the various D8 Supervisor candidates stood on the issue? I’m glad to see the Yosemite Slough bridge in the plan. It seems as if omitting the bridge would result in longer trips and more pollution overall. I can’t even figure out what the opposition to the bridge was. Does anyone know why it was controversial? I know why the bridge was controversial when it was first proposed (by Willie Brown) and I’m assuming it’s the same: environmental impact. Not that I agree with this reasoning, but some folks think that building a bridge over the Slough, which has some habitat value (degraded though it is) would hurt the birds and fishies and the potential to improve the slough as a real environmental resource. I’m pretty sure that SF Audubon came out pretty strongly against the proposal. Put the bridge in… if i swam across i would probably cause more of an environmental impact. I live in D5 and am starting to get annoyed with Mirkarimi. Either vote against the project entirely, or vote in a way that lets it proceed. Do not be a [Removed by Editor] and vote for an amendment that makes it impossible, then later vote to let it proceed as planned. To say nothing of his dithering around/do-nothingness when it comes to wrangling Bay to Breakers back into something enjoyable for party-goers and homeowners alike. Not to sound too cynical, but what are the chances of actually getting funding sometime in the not too distant future? It just seems so out of the realm of possibility… but who knows? Slim to none – on getting the funding. With the 49ers moving to Santa Clara, any revenue counted upon from a stadium and supporting features is gone too. If this ever gets built it won’t likely be for 20 plus years. Yes, the opposition to the bridge was on environmental grounds. It certainly makes sense that a bridge will impact the habitat and I’m sure that the design and construction plans will be done to mitigate that impact and hopefully that will be enough to protect the wetland. It is interesting to see how one environmental oriented group will only focus on issues within their purview and ignore other environmental effects. It is not the first time that the Audubon Society’s recommendations run counter to general pollution abatement / global warming concerns. Opposition to wind power comes to mind. I may be a pessimist, but I strongly believe that it will take a long time until this neighborhood will be anything close to what people envision today. Giving out new housing to people on the dime of the tax payers will do nothing but perpetuate a cycle of leeching off the government and not working. If people have no incentive to support themselves, they will have very little desire to advance. The root of problems in these neighborhoods is not the lack of quality housing, it’s the lack of education. Social and government programs exist to help people. Unfortunately, many people abuse these benefits and produce nothing valuable in return. I wonder if anyone there knows that you can get PAID to go to City College and earn your degree if you qualify. Tuition, books, transportation and other expenses are covered. This brings me to another point. Gentrification can only go so far. Yes, there will be an influx of new residence that will help raise the overall quality of the neighborhood. But how much can that do? If you are about to spend $500k on a house, would you want to live next door to someone popping out 5 kids just to leech off welfare? Probably not. As someone pointed out before, the other residence will be more than happy to watch over your house while you’re gone at working. They will most likely use you and your belonging as their personal ATM. As pointed out, the next problem is Lennar acquiring financing. If I were a lender, I would have to spend a nice long time underwriting this deal to make sure it pencils out. No one wants to end up holding the keys to a bunch of empty units in Hunters Point. I truly hope this makes the neighborhood nicer. It would be nice to actually go there one time without the looming thought that you may get shot/robbed/murdered in broad daylight. I just don’t think it will happen anytime soon. However, I’d love to be proven wrong and will be overjoyed when that happens. The Attack of the Welfare Queens in their Cadillacs! Prozan and Wiener’s views are more similar to Dufty’s, and Mandelman’s are more similar to Campos’. So . . . what is a property worth that is sitting on one of the country’s worst Superfund sites?